St. John’s wort is probably the best known natural antidepressant. It works similarly to conventional antidepressants in that it inhibits the reuptake of serotonin, norepinephrine and dopamine. Most products used in scientific study are standardized to the component hypericin, but antidepressant activity has also been attributed to hyperforin. Standardization is important, as many St. John’s wort products available over the counter have been shown to contain little or none of these active ingredients, making them essentially useless. St. John’s wort has been the subject of much discussion and controversy in the scientific and medical community. The vast majority of evidence suggests that St. John’s wort is effective for improving mood and reducing insomnia and somatic symptoms of depression in those with mild to moderately severe depression. 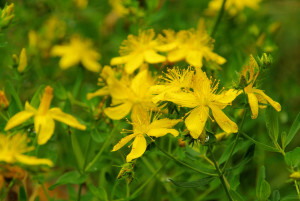 St. John’s wort appears to be comparable to low-dose tricyclic antidepressants, as well as the SSRIs fluoxetine (Prozac), sertraline (Zoloft) and paroxetine (Paxil). In addition, there are significantly fewer side effects than with antidepressant medications making St. John’s wort much more tolerable over the long-term. If you are taking any medications, you need to consult your health care provider prior to taking St. John’s wort. If you want to try St. John’s wort, the typical dose used in clinical trials is to take 300 mg (standardized to 0.3% hypericin and 3-5% hyperforin) three times daily.